The Learning Curve Tightens… and so do our Belts. Storyteller First… Writer and Author Next. Told you the path was sometimes flooded and muddy, and for a decade, it was also… well, just look at this picture! Speechless now? If you think my books will be works of fiction with intricate plots that twist and turn, filled with wonderful imaginary characters living out quite fantastic lives – you’re visiting the wrong author. I am Christine – a proudly Australian farmer, wife, mother and grandmother. 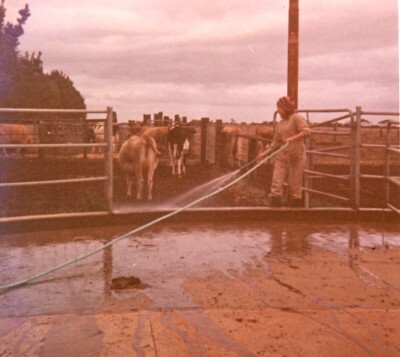 My first book for mature readers is a memoir of the earliest of 40+ years of farming. Each chapter is a small story of the myriad experiences my husband and I enjoyed and endured as a city couple ‘going country’. If you have come here looking for tales of yesteryear with a rural flavour, make yourself comfy – you have discovered my much loved niche. Perhaps you enjoy a story that makes you a little ‘teary’ now and then (for both happy and sad reasons), and moves you deeply. Or maybe your curiosity about rural life last century needs answers. Early lessons on an ancient Imperial typewriter gave no hint that far in the future I would become proficient on a computer and clumsily attempt to embrace my corner of this technological world. Nor did the plug and cord phone switchboard I once operated whilst answering business calls in the most polite, precise and welcoming fashion prepare me for such questionable digital delights as mobile phones, i-pods and pads, etc. developed a deep desire to promote better understanding between people with different (even oppositional) skills. My passion was born to share the tales of our transition – to inform and entertain; to produce laughter and tears; to raise awareness and promote understanding of why many city/country differences exist. I am the storyteller who has had a foot in both high heels and rubber boots. What a joy and privilege it has been to have known secretarial skills and pastoral pursuits… and to have survived with the ability to tell the stories (hence the ‘Storyteller’ label first). At last, here on our small retirement farm the stories still roll and my plan is to share them all, now time finally permits sitting down a whole lot more. A different discomfort develops as I experience writer’s cramp, diminished vision (it’s a serious matter when you take off those rose-tinted glasses) and most importantly, a befuddled brain that tries desperately to put that multitude of memories into readable order. I think I’m winning, but I tend to be prejudiced. Best leave the final judgement to you, my reader. I would appreciate your opinion about this site, my memoirs, my opinions – even me. You can leave your comment below or check my Contact page to find your choice of communication with me. I will get back to you as soon as I can. I like these pages. Love the layout, the wavy edged text box over the picture of the soft sunset (or is it a sunrise?). You already know I love your stories. My question now is… is this your latest website? I cannot find the note I made when you announced you had a new website so I googled you. And no… sadly this is a much neglected website – on my ‘To Do’ list (as in seriously update), however, HAPPILY, the link to ceedee moodling on the front page IS my born-again website and I AM working on that in between… well, everything else (a prodigious list for an old girl). This first farm memoir is far from my best writing so far, but a nice milestone for me to look back on. Edits on the second one (dairying) happen sporadically. All readable on WP. Still love it as much as first time I saw it. Sadly, it probably isn’t reader friendly across all today’s reading gadgets – that’s mainly why my main website was changed. All on the slim possibility someone will investigate after OMP anthologies shine their full light (I’m in the Fiction one). I am an Australian storyteller, farmer, wife, mother and grandmother. I'm a 'born again' writer, enjoying a small amount of success, whilst having the time of my life - both past and present. Welcome to our farming world.